America's WildRead: Do you have your copy of Chasing Monarchs: Migrating with the Butterflies of Passage yet? 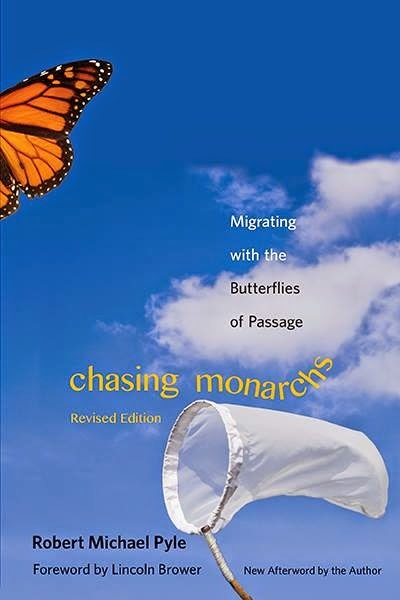 Do you have your copy of Chasing Monarchs: Migrating with the Butterflies of Passage yet? Almost one week out and Robert Michael Pyle will post his first commentary for our book discussion. Time to locate a copy of the book at your local bookstore or order direct from Yale University Press (YUP). Another idea: Check out whether a library near you has a copy in stock. Remember the YUP edition is a reprint of an earlier printing but includes an afterword by the author plus updated information on the myriad threats to monarch butterflies; this new edition also includes the various efforts under way to ensure the future of the world's most amazing butterfly migration.